Enslaved: Odyssey to the West starts off humorously, but with a terrible idea. In a post-apocalyptic world where some past war eliminated most of the humans and let machines inhabit the land, you find yourself (Monkey) aboard a "Slaver" ship. While contained in a cell you are accidentally freed by Tripitaka ("Trip") a tech-savvy woman that is escaping. In the series of events that leads to the ship crashing she repeatedly ignores your pleas to help and she effectively tries to leave you behind to die multiple times. Once off the ship you awake to find yourself, not just alive, but now enslaved to Trip through a technological headband. If you disobey her whims or stray to far, you die. So we end up with the mindful, cautious and plan-making, Trip and the primate-like, muscle-bound, tail-like belt-wearing Monkey. Almost two complete opposites working together. A majority of the game is spent escorting/protecting Trip back to her home. Once there things have taken a turn for the worse and there is no one around. Forcing you to move on and help Trip further. Gradually the pair form a platonic bond and continue the journey, but I don't think the headband is removed which might just be an oversight, but I can't be sure. When it comes to combat, there is a mid-sized range of abilities to combat- mostly provided by Monkey's all purpose staff. It can project a limited shield, be used for medium and strong attacks, and even has two different long range plasma shots. You may also call on Trip's assistance through diversionary tactics such as a hologram to draw enemy fire. Not the most wide range of stuff, but enough for the game. A majority of Enslaved felt decently balanced in the fighting, with only a couple areas that felt too unfair- particularly the end boss that is roughly 1,000% too long of a battle with far too many segments to fight through. What gets to be an issue is the lag in controls. There are times where inputs are noticeable in full seconds- which can be the difference in life or death in a battle. They aren't the worst I've experienced, but they aren't even close to the best either. There is also a ton of small platforming where Monkey has to scale and traverse large sections of crumbling architecture. Thankfully this is much more forgiving than the combat is. Most of it is safe so it isn't as bad as other games where you can toss yourself into a gap without wanting to. Notably there are a couple sections where you get to ride on a "Cloud." Monkey's energy hoverboard. I think they could've added a little more of this with a longer leash from Trip. The leash thing was cumbersome on the Cloud because if you hit a ramp at the wrong angle it would send you sailing into the death zones and you'd begin at the last checkpoint which could be a long way back. 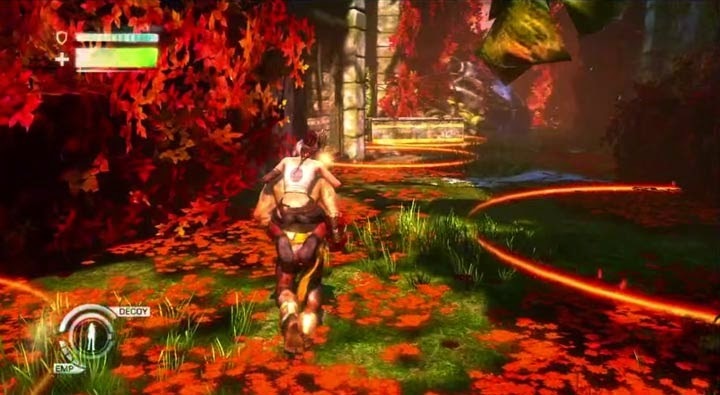 Developer Ninja Theory based this game on an old Chinese myth called "Journey to the West," in which a monk uses a magical headband to force Monkey (a Monkey King, to be precise) into assisting him on the adventure. The story feels simple enough, but also has the undertones of archetypal meaning. There is depth here, and the end proves to be either fully enjoyed or disliked. I personally liked the end, although maybe more seeding of it should've been done throughout the game as a whole. Ninja Theory bringing back Andy Serkis, actor extraordinaire, probably saved this game from absolute demise. They used him in Heavenly Sword, and it helped there, and he has once worked just enough of his magic again to keep Enslaved a slightly better than mediocre game. Lindsey Shaw has done a tremendous job as Trip as well, I don't want to make it seem like only Serkis was good. The acting anchored the game enough to keep them from appearing as just a bunch of caricatures. While Enslaved has some great character moments, a bunch of humor, and decent merits all around it lacks just enough that it can't be a truly great game. I think having awesome facial animations and voice acting can go a long way, but when the limited combat can be choppy and unresponsive at the worst times it pulls the game back a couple notches. Top that with some odd graphical hiccups and framerate stuttering it falls just a little further down. The entire game was worth the time for the story and acting alone, but as I said, it's the things that aren't quite great that keep this from being truly amazing.